It's funny but I usually don't feel like I get tripped up taking language and expressions literally. Not the way classic aspies do anyway. for example; "beat around the bush", I'll usually enclose it in inverted commas. Even when talking, if I use an expression, I'll either use a different inflection or I'll draw virtual inverted commas as I use it. So yeah, I like to think that I'm immune to expression problems. Even so, I've had my share of bad ones most notably my "bring a plate" cringeworthy example. I don't think I'll ever recover from that. It was very, very embarrassing. Then of course, there's the time I asked someone how badly they needed to use a toilet because ours was "only for emergencies". My wife, of course loves to remind me of the time I changed a tyre by throwing the old one away. I've grown out of them though. I've learned "all" of the expressions that exist and I pick up on new ones fairly soon (often after a little embarrassment). <-- Yes, that's all mean't to be sarcastic. My wife and I went out to afternoon tea last weekend and I was feeling really hungry. She ordered a cake and tea. "a selection of small cakes with cream or ice cream". That sounds good I thought but just to be sure, I asked what cakes were in the selection - I hate sultanas and didn't want to get any of those. Nope, they were all nice sounding cakes. "Ok, I'll have that one", I said. "Which cake sir? ", came the reply. "uh... the sele.ect..ion" I replied, as it slowly dawned on me that maybe it wasn't a plate full of petite cakes..
Why would they be "small cakes" if you only got one? I thought. That's silly. "do I have to choose just one? ", I said somewhat unnecessarily. I looked over at my wife. She was nodding in embarrassment. Luckily, I think our waiter belived I was joking, or he was very polite. 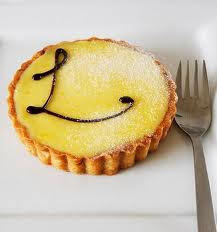 I chose a lemon tart and he walked away. "oops... I think I got away with it", I said as my wife facepalmed. my Sunday SnapsShot is about food is you'd like to post a link to your post you'll be the first one of the week! I think you were a victim of poor wording there, Gavin. "A selection of small cakes" means several small cakes. A better wording would have been "your choice from a selection of small cakes". If it makes you feel better, I would've done the same thing. I'm with CelticRose. The wording of the menu was ambiguous. I find that I don't have a problem with interpreting idiomatic expressions--in fact, I love seeing the literal meaning standing side-by-side with the figurative meaning. That's what makes idioms fun. I know plenty of autistic people who are excellent at wordplay and very clever about using the multiple meanings of words. I find that my main difficulty with language is that I tend to be much more exacting about it than others, so I have to ask for clarification when something is ambiguous. Someone else might be able to figure out the ambiguity from context, but I don't think this has to do with autism. I think it has to do with seeing all the possibilities for what words might mean and needing to clarify which one is in play. It's the reason that a lot of people don't do well on multiple choice tests--there are always good reasons to choose more than one answer. I see this as a sign of a strong mind, not a weakness. I'm quite particular about how I use language, and I wish others would do the same. Language is, after all, how we communicate our thoughts and emotions to each other and poor communication can lead to unpleasantness. Aspergers notwithstanding, seeing the phrase "a selection of cakes" would give me the same interpretation you had. "Cakes" is plural, therefore I would expect an assortment of miniature cakes on a single plate. As another comment indicated, the menu should probably have read "your choice from..." "Choice" is singular, which implies that you would have *one* cake. The language on the menu was poorly chosen, thus leading to confusion. I believe the onus is on the restaurant to correct their language use; you are certainly not to blame for misunderstanding something that they did not state clearly. Sorry for the rant - poor communication is an annoyance trigger of mine. The wording is difficult, for sure. Sorry you were a little embarassed! My boys' challenges with this are still rather innocent -- like Gabriel's belief that some people are truly born with 'two left feet' and that logically that would make it hard for them to dance. And often it is just his black and white approach, like when I told him if he broke his brother's toys he would have to use his gift cards to buy new ones, he yelled, "But they are made in China!" And I said, "So?" And he responded, "I don't have gift cards to China!!" Couldn't help but laugh. Gavin, I read your post three times before I understood what was wrong. You're definitely not alone. Someone ought to write a book titled 'Aspergerisms', and detailing lots of examples of how we can misunderstand people that are not clear enough in what they say. Some of the mistakes made can be quite funny on reflection, lol. I also agree that the menu wording was poor and confusing. Don't feel bad! I agree that the wording was poor. I would have wondered the same thing. I am very good with idioms, and such but it took some learning. I still remember, my very close friend, in a very straightforward manner, told me "I can't chew gum and walk at the same time." I said "Really! I always thought that was just a phrase, how interesting! I wonder what's so difficult about it?" He then had the slightest hint of surprise and amusement on his face. Which, at the time, I understood to mean that he was pleased that I enthusiastically enjoyed his revelation. (He did love attention!). Now that I'm older... I realize why he was amused... >_> haha. Hmm, specificity. I wonder, if nonverbal communication is supposed to be ~75% of all communication, is that the reason aspies prefer clear communication. I tend to hate ambiguous statements, especially when I'm expected to automatically Know, which is the right one. I had never heard about verbal language being so tightly bound to 'truthful' statements. I agree with CelticRose - that menu was very badly worded. You were correct to assume you'd get a selection of cakes. Now that I suspect I have AS, I can look back on incidents such as that one and not feel quite so dumb for taking things literally! Funny thing is, I'm actually pretty good with interpretting metaphors, etc. I just find some phrases quite ambiguous. Although they may have felt that "your choice" amongst their "selection" was implicit, you are not alone, I too prefer instructions to be more explicit. Part of this is taking things at face value. This also applies for when people are telling me a "tall tale" and I say "really? ", with genuine astonishment!